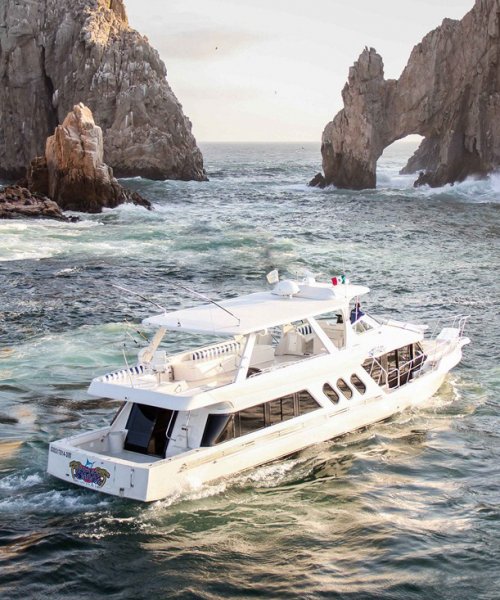 The 'Cabras' is a Hatteras 64’ Convertible which benefits from the advanced technology developed for the Hatteras 68’ Convertible, including a passive underwater exhaust system that reduces cockpit fumes, transom buildup and cockpit noise levels. The advanced convex hull shape harnesses the energy of today's high horsepower engines to deliver a smooth ride, peak performance and improved stability. One step up from the salon, the 64's galley features solid surface granite countertops, under counter refrigeration including freezer, a four burner ceramic cook top, and garbage disposal and microwave convection oven. Opposite is a large dinette with granite tabletop. Down below, the full beam configuration of the master suite is more than just best in class. It offers an unparalleled 166 square feet of floor space virtually identical to that of the 68 Convertible! Accessed through a private foyer flanked by a full 92 inch hanging locker, the master suite has more than enough room for a king sized berth, twin nightstands, and dressers port and starboard plus a 20 inch LCD TV. Two oversized port lights admit light and provide a water level view to either side. At 74 square feet, the bow stateroom on the 64 Convertible is virtually identical to its counterpart on the 68. It has a queen sized berth with storage underneath. Two cedar lined hanging lockers are included along with ample drawer and cabinet space along the hull sides. The port stateroom is fitted with twin berths, along with a hanging locker, hull side storage and nightstand. The three heads (bathrooms) for the staterooms are all en-suite would not go amiss in a 'design hotel', offering comfort, space and practicality. With standards of accommodation onboard this high you may even prefer as an owner to forego your hotel room!